Not everything works the first time, and sometimes even when it seems to work, things don’t happen quite as you expected. Juju provides commands to help developers debug charm code, and there are also community written plugins that can help with the debugging process. Juju provides two commands, juju debug-log and juju debug-hooks, to help developers resolve problems in their code. The dhx debugging plugin improves the debug-hooks experience by performing some common actions automatically. Or maybe you’re having an issue with building from your charm layer, in which case the debugging with layers is where to look. Logs are indispensable when it comes time to troubleshoot. View the log with the juju debug-log command. The output is a consolidation of all the Juju log files streaming in real time. 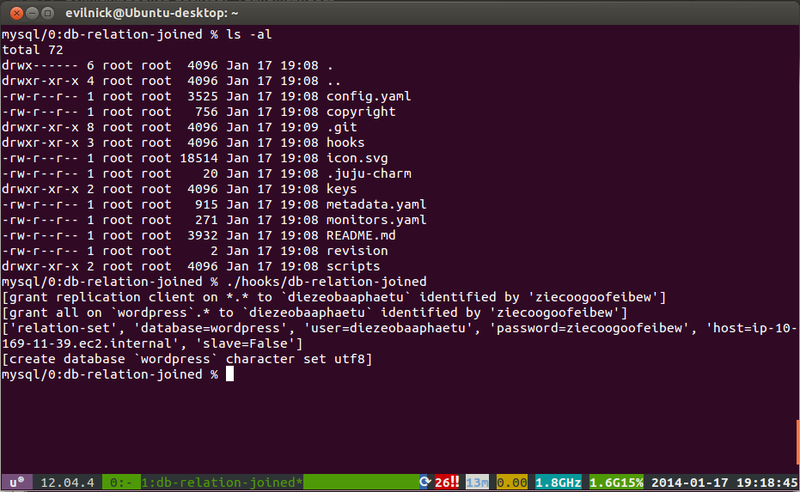 The logs show you detailed inner workings of Juju and any juju-log messages that are run from the charm code. See the troubleshooting logs section for more details and filtering options with the juju debug-log command. Since log messages stream in real time, it is possible to miss messages while using the debug-log command. In the case where you need to view the log files you can ssh to the machine and view the log files. To access the individual machine use juju ssh <machine-number> to get access to the machine and the Juju log files can be found in the /var/log/juju directory. Fore more information about what you can do with the log files please refer to viewing logs. Beginning with Juju 2.0, the machine running the controller is not represented in the Juju model and therefore not accessible by machine number. If you need the log files from the controller you must switch to the “admin” model and ssh to machine 0. Replace “local.amazon” with your current controller or just use “admin” to switch to the admin model for the default controller. It’s often useful to be able to test code in the same context that a hook executes in. The juju debug-hooks command allows you to do exactly that, whether it’s to debug a failed hook or to write and test new hook code. Additionally, if your hook is already in an error state, you can enter into an interactive hook context using the juju debug-hooks command. The session is interactive because Juju will block allowing you to run the hooks manually to check the return code or edit hook files before running the next hook. To reach the hook context Juju must retry the failed hook. You can retry a hook in error by issuing the juju resolved command. See the Retrying failed hooks section for more information about how to retry hooks. It is possible and often desirable to run debug-hooks on more than one unit at a time. You should open a new terminal window for each. Learn more about actions in Working with actions. When you run the debug-hooks command, Juju creates a slightly customised tmux session on the machine running the requested unit (if you are unfamiliar with tmux, see the primer at the end of this section). The tmux session will start with window 0. This window does nothing other than keep the session alive (though it can be used, for example, to view the log files for that unit (in /var/log/juju/). A new window will be attached to the tmux session. The bottom left of the status bar will change to indicate the current hook that has been trapped. The shell will be running in the standard hook context. Additionally, the environment variable$JUJU_HOOK_NAME is set appropriately. To proceed, you should manually execute the hook, or perform whatever other actions you want. At any time during a debug-hooks window 1 session you can run any of the standard hooks (install, start, stop, config-changed, upgrade-charm) however you can not run any of the relation hooks - these should only be run during their respective trapped events. Whilst you are debugging a hook, it is possible that other hooks will be queued to run. Even hooks which are not in your list to debug will be suspended in the queue until you exit your current window. See the special considerations below. The queue for pending hooks will restart once you exit the window with an exit command. To allow Juju to continue processing events normally, you **must** exit the hook execution window with the `exit` command, otherwise all further events on that unit will be paused indefinitely. The queue can be halted by exiting with an exit 1 command, which will flag the hook as failed. Juju will revert to its normal behaviour of suspending everything until this error status is resolved, which you can do by issuing the command (from your juju terminal window, not the debugging window) of juju resolved <unit>. You can finish your debugging session by closing all windows in the tmux session. Make sure to exit appropriately from all hook windows before terminating. Hooks returning errors are automatically retried periodically. However, the juju resolved command may still be used to retry the hook immediately. See the General configuration options for more information on the automatic retry feature and how to disable this behaviour. Note that option --no-retry can be used to prevent re-execution of failed hooks on the unit. Debugging a reactive charm is similar to debugging a regular charm: use juju debug-hooks to get into the hook context and you start the reactive framework by executing the hook file in the hooks/ directory. That hook will start the reactive framework and run your handlers based on which flags are set. Note that the reactive framework resets all flags to their original value when a handler crashes. Changes to flags happen immediately, but only persist at the end of a complete and successful run of the reactive framework. All unpersisted changes are discarded when a hook crashes. This is the case because a Juju hook is transactional: all changes are discarded when the hook fails. There is a command line charms.reactive tool that can help with debugging charms. You can use it to view, set and clear flags within a debug-hooks session. Charms built with older versions of the reactive framework might require you to use `state` instead of `flag`. All flag changes are reset when a handler crashes so this command will only show the initial values when the hook was started. The install, config-changed, and start hooks often execute quite soon after the unit comes up, making it difficult to start a debug-hooks session in time to intercept them. If you’re having difficulties, you can temporarily return an error code from your install hook (e.g. add an exit 1 at the end of it), and start your session only when the unit reports an error status. Use a debug-hooks session to interact with the environment and run the hook again. While you’re debugging hooks for one unit on a machine, you’re blocking execution of all hooks on that machine. This is generally helpful, because you don’t want to have to contend with concurrent changes to the machine’s software, but you should be aware that multiple debug-hooks sessions for units assigned to the same machine will block one another, and that you can’t control relative execution order directly (other than by erroring out of hooks you don’t want to run yet, and retrying them later). What on earth is tmux? 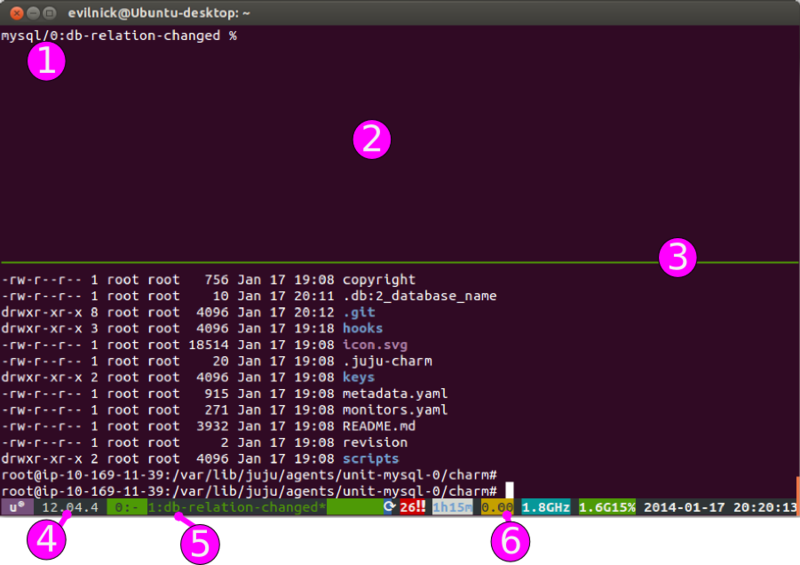 The Ubuntu images used by Juju also include a slightly customised version of tmux, a terminal multiplexer. It is very useful when debugging hooks, as new hook events can be opened as windows within tmux, meaning you don’t need to deal with so many open windows, or (hopefully) get confused as to where to run commands. This version runs through a layer called “byobu”, which additionally adds some useful status information at the bottom of the screen. A running tmux environment, involving one or more windows/panes. A single screen, possibly containing many panes. A rectangular section of the current window, where commands are entered. The default prompt is changed to indicate the machine you are running on, and the hook that you are debugging. This is a tmux pane, after the screen has been split horizontally. Pane dividing line. The active pane is the one with the cursor in! The byobu display shows the OS and version info. This area lists the currently open windows, the current one is highlighted. The end part of the status bar indicates uptime, load, processor, memory usage and the current date/time. All of tmux’s special functions can be run by pressing the prefix-key followed by another key or key combination. The default prefix-key for tmux is Control-b, but many users find this an unnecessary stretch. This version uses Control-a as the prefix key, which is a bit easier on the fingers and is also the same combination used by screen, an alternative terminal multiplexer. Control-a 0 Switch to window 0 (similarly, any other numbered window). Control-a c Create a new window. Control-a n Switch to the next window. Control-a p Switch to the previous window. Control-a w Choose a window from a list. Control-a % Split pane vertically. Control-a o Switch focus to next pane. Control-a ; Switch focus to the previous pane. Control-a ! Move current pane to a new window. Control-a x Kill the current pane. Control-a ? Show currently configured keys. You can get more info on tmux and its commands at the relevant Ubuntu manpage entry. If I try to use less to look at a file, I get a warning because it’s not a proper terminal. I am unable to scroll through the file with less, it prints part of the file, with some stray random characters at the top and bottom of the screen, and I cannot scroll. Why not just run a normal tmux session? I am also finding that it takes anywhere between 10 seconds and 10 minutes for the pwd to change and something to be printed when I run debug-hooks. How long is it supposed to take? Update, I just ran juju debug-hooks. It is taking 30 minutes and counting. Can you add juju debug-hook X Y as an alias for juju debug-hooks X Y? If Y is specified, only one hook will be debugged, so it’s unintuitive to use the plural. @mdavistelstra Hi! Your posts in this ‘Docs’ category may get more eyeballs if they were in the ‘Users’ category. I believe there is a way to move them.